Plenty of materials and commodity related stocks have been running hot lately. Most of the time, we focus on the strongest stocks trading near their 52 week high or all-time high. STLD – Steel Dynamics and WLDN – Willdan Group are big winners we are currently holding in that sector. Sometimes though, we focus on special situations that offer massive profit potential. 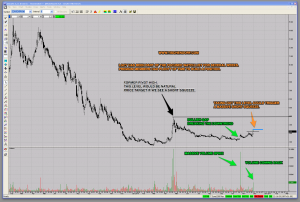 LGCY – Legacy Reserves LP, a completely beaten down Oil and Natural Gas stock is offering such an opportunity. The stock has recently executed a loan credit agreement that strengthens the stock’s balance sheet and provides time to benefit from an industry recovery and higher oil prices. LGCY is a high risk play, but its Short Squeeze Potential is simply outstanding. I recently reopened a position as the stock was able to push through key price levels I highlighted for members. Huge run-up on massive volume in April. Monster volume spike in October. Gap up breaking the stock’s downtrend. The stock has been able to put in higher lows and higher highs ever since. Now volume is coming back into the stock. If this pattern continues, the stock will be able to print additional higher highs. Every new high will put incredible pressure on traders and ultimately force them to cover their short positions. We are witnessing the first signs of technical strength. The tide might have finally turned. During those initial stages of a Big Trend Change the majority of traders are not positioned correctly. The downtrend has been so brutal that traders have come to expect the stock to go down forever. When the facts change, it is easy to be in denial and fight the new uptrend. This is precisely what provides the fuel for a massive short squeeze. The only thing the stock needs to do now is to cross the blue line. If we see a big short squeeze the former pivot high will act as a magnet providing us with a technical Price target around $4.00. Use a stop loss to protect your capital.